Tesla just released some interesting footage and a photo of an automation robot testing Tesla Model 3 seats for durability. Tesla team has named this specific robot ‘Groot’, a fun reference to the superhero tree character from Guardians Of The Galaxy movie. The R-2000 range’s all-round model, the flexibility offered by this 6 axis high-payload model sets new standards in almost every industry. Equipped with a thin wrist and capable of delivering excellent cycle times, it makes a nimble spot welding robot on automotive and similar applications. It has also been designed to maximise use of space and enable it to work in close proximity to other robots. Tesla claims that this extensive testing of the Model 3 seats consists of ‘40,000 cycles which are equivalent to 12 years of seat use’ — in actuality, these seats are meant to last more than 12 years, Tesla is playing safe with numbers here this time. 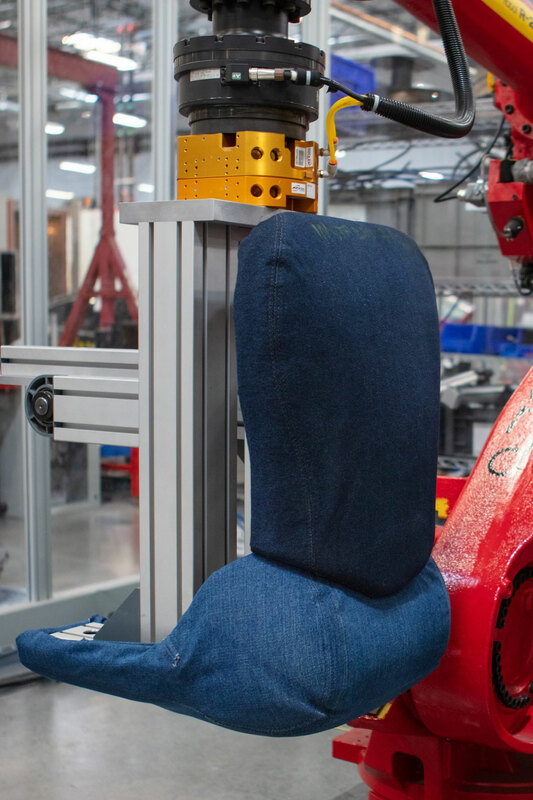 In reply to a question about the testing model’s fabric which resembles a human bottom, Tesla replied that the tester is actually wearing a ‘blue jeans’ which can be seen in the picture below. Tesla Model 3 white seats are made of vegan leather that is extremely stain resistant, up to the point where you can spill red wine on them and wipe-off, seats will be like nothing happened. So the stains of the blue jeans in testing should be removable as well. Some Tesla Model 3 owners have confirmed that after use of several months they are able to easily wipe-off the blue jeans stains from the seats. Tesla Model 3 seat tester model wearing blue jeans for stain resistance testing. Currently available trims of the Tesla Model 3 (mandatory premium package) have 12-way, power adjustable front seats with lumbar support — all of the front and rear seats are heated and heating can be controlled for all individual seats via the center touchscreen interface. The standard range lower-cost Tesla Model 3 that is expected to go to production this year will most probably be manually adjustable, dropping the power seat adjustment option to lower production hassles and cost.